Because home buyers generally have very little interest in the real estate market when they are not buying a home, they don't always know how the market moves from one season to another, much less from month to month. It is often uncomfortable for a buyer to be told the market is a seller's market when the buyer may believe otherwise, especially a buyer who is trying to buy in a down real estate market. Markets can change almost overnight. When the market changes to a seller's market, a buyer's home buying strategy needs to change with it. 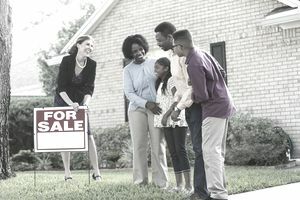 In a seller's market, a home buyer is unlikely to be successful using the same techniques practiced in a buyer's market. Time is of the essence. Multiple offers happen with more regularity in a sellers' market than a buyer's market. That's because by its very nature a seller's market is defined in part by low inventory and lots of home buyers. A beautiful home that is priced well can attract more than one offer. Remember, you might not be the only buyer. Earnest Money Deposit. A larger earnest money deposit might look very attractive to a seller. Ask your agent for advice on the deposit; then consider doubling or tripling that amount. You're going to pay it anyway at closing. Don't Request Favors. This is not the time to ask the seller to give you the refrigerator or washer and dryer, or part with fixtures, or paint the front door. Delay Buyer Possession. If it is customary for the seller to move at closing, give the seller a few extra days to move. Another buyer probably won't think of this maneuver, and the seller will look more kindly upon an offer that lets them move at leisure. Think of it this way. Say a listing agent has two offers. One is exactly the offer the seller would like to sign. The other offer is not, and the other offer would need a counteroffer from the seller to compensate. Should the listing agent prepare a counter offer or should the buyer's agent revise the offer? In this situation, it is better for the buyer's agent to revise the offer. It is faster. During the time it would take the listing agent to prepare a counter, send the counter offer for a signature, and then deliver the counteroffer to the buyer's agent, another full price could arrive. If you want to be the first offer, the best offer and the only offer the seller will accept, your offer needs to match the seller's expectations. If you wait for the seller to sign a counteroffer, your offer could fall by the wayside. Your buyer's agent can find out what the seller wants by calling the listing agent or by reading the verbiage and instructions in MLS. Ask to see the agent's MLS information sheet. The agent's MLS printout is probably different than the information a home buyer receives. Don't be that buyer who wants to wait until the weekend to view a home in a seller's market. By the weekend, that home could be sold. Try to be one of the first showings. Sellers usually don't enjoy having buyers come through their homes at all hours of the day, so most would like to see their home sold quickly. If you write a good offer, a fast offer and a clean offer, your chances of acceptance are far better than those of a buyer who is unprepared. It may astonish you to know how many buyers are often unprepared.